Get information on the city of Kovalam, Kovalam Travel, Tourism in Kovalam, Hotels in Kovalam, Kovalam Hotels, Kovalam Tours, Kovalam Tourism, Visit Kovalam, Kovalam all-inclusive tours, Kovalam travel package. One of the chief tourist destinations in Kerala, the town of Kovalam experiences heavy influx of tourists all through the year from various parts of India and the world. Kovalam Beach actually is broadly composed of three adjacent crescent beaches, Lighthouse, Samudra, and Hawah each separated by rocky promontories. Best visited during the months from September to March, the Kovalam Beach is one of the choicest holidaying options comprising aquamarine waters, gleaming sands, and palm fringes. Some of the most popular activities here include the Catamaran cruises, on the country rafts. Very recently a new tour operating company of Trivandrum has found a new package suitable for deep-sea fishing. This new project revolves around the Vizhinjam fishing harbor, at hardly 4 km to the eastern side of Kovalam Beach. Water sports lovers can make good use of surfboards and boogie boards that are obtainable on rental basis on the beach. Among other alluring tourist activity options are the Ayurvedic massages and treatments provided at several resorts and hotels on your tour to Kovalam. In Kovalam There are a number of Yoga centers as well. Recitals of some of the cultural Kerala art forms like Kathakali and ethnic martial art, Kalarippayattu can be extremely fulfilling. Kovalam Ashok Beach Resort, Somatheeram, Coconut Bay Beach Resort, Niki�s Nest, Uday Samudra Beach Resort, Surya Samudra Beach Garden, and Hotel Samudra are some of the most frequented among innumerable beach holiday resorts. 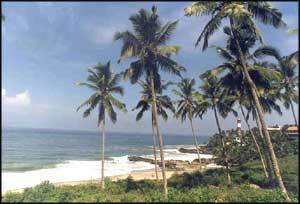 Most of these private beaches are positioned in close proximity to Vizhinjam at hardly 8 km away from Kovalam. At just sixteen kilometers north of Kovalam, the holy city of Anantha, Thiruvananthapuram City can make for an exhilarating trip from Kovalam. Sri Padmnabhaswamy Temple is a significant tourist site of this city. Puthan Malika or Horse Palace is a wooden palace, situated near the Temple. The assets of the royal family and the very structure of the palace are some of the appreciative elements of the place. Located few meters away, the Chalai Market is a sprawling typical Keralite marketplace. The Napier Museum constructed in Indo-Saracenic Style, is positioned just 3 km away. Positioned about 60 km away from Thiruvananthapuram city, the hill resort, Ponmudi is known for its tea plantations and jungle streams. Another lovely site to be visited is Kanyakumari (Cape Comorin), the southern tip of the Indian subcontinent. Sited 90 km to the east of Kovalam where three oceans converge, Kanyakumari is located in the state of Tamil Nadu. A few moments on the Vivekananda Rock here located exactly on the sea can be an extremely soothing experience. Padmnabhapuram Palace, the second largest wooden palace in Asia, on your way to Kanyakumari, is a major tourist attraction in Kovalam. Log on to www.touristplacesinindia.com which gives online information on Kovalam on your tour to India.